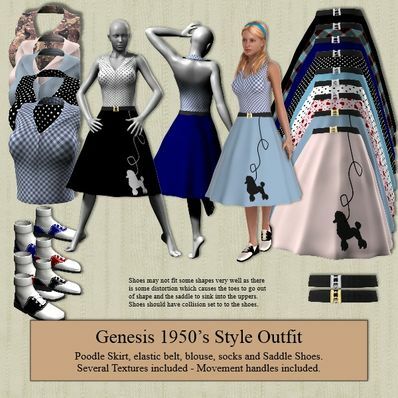 A 1950's style outfit for Genesis for use in Daz Studio 4.6. A Poodle skirt, blouse, socks and shoes. Set collision on the shoes to the socks. Shoes may not work with all shapes as some distortion will be caused. The quality of your work and generosity is awesome. Thank you so very much. Oh, the poodle skirt is so darling, just love it! You even included the wonderful shoes and socks, You are marvelous, thank you so much. Such a darling outfit and such great textures and accessories! Really nice outfits, stylish. ty. What a darling outfit, love the poodle skirt and the saddle shoes and socks, you really pay attention to details!